I had a strange dream the other night. I dreamt that I was at a doctor’s office for a routine check-up. We all know that for some reason, doctors always want to weigh you at these routine check ups. As if knowing your weight will reveal some individualized key to wellness that they can’t get by asking you some simple questions. I looked down at myself on the scale. I was the same me as I am in reality– the same shape, the same size. How could I possibly weigh 196lbs? At first I was impressed: ‘I’ve been carrying around all of this weight in muscle!’ I thought. Then, I started to feel self-conscious and a little depressed–how could I possibly weigh 196lbs? I woke up with knot in my throat. Even though I knew it was a dream, I was thrown off by how much a number affected me. By how much it affected me despite me being the same size in my dream and in reality. What does it matter how much I weigh if I’m healthy, active and happy? What does weight matter, anyway? In real life (as opposed to dream life) I haven’t weighed myself in at least 9 months. Sometimes I’m curious about what I weigh, but memories of the feelings of disappointment that I used to get when I looked at the numbers on a scale far outweigh my curiosity. I choose not to weigh myself because my weight is not an accurate representation of my health or of who I am. I choose to stop weighing myself because, for me, seeing that numeric measure of myself nurtured negative habits and fed my negative self-image. My weight was never good enough for me. It never changed enough for me: it was never what it was supposed to be. I stopped weighing myself because I realized that my discontent with a number on a scale was ridiculous– I could wake up in the morning and feel great about my workouts and my healthy lifestyle, then step onto the scale and my good mood would instantly evaporate. Even if my clothes fit comfortably, or looser than before, if the number on the scale was not what I imagined it would be, I would be instantly upset. I allowed the scale ruin many of my mornings and I got tired of feeling bad about a silly number. Since I stopped weighing myself, I care less about what I weigh. I can’t say that I don’t care at all–I’m not sure if getting on a scale would bring back those negative feelings or not–but I don’t place so much value on that measurement any more. I no longer rely on my weight to tell me that I’m healthy or good enough. I’d rather measure how much weight my body can lift, and how fast and how far it can run. I’d rather quantify myself by how much love and laughter I put into the universe and by the things of which my body is capable. I admit, sometimes I pinch my stomach to see if there’s more tummy there than before…but it’s more important that I’m happy and that I love myself the weigh I am (Ha! get it?). Loving yourself automatically makes you healthier. For some, the scale can be a useful tool, but for others, it can produce anxiety and dread. I know some people who are unaffected by numbers on a scale, but I know more people who hate to have themselves weighed. 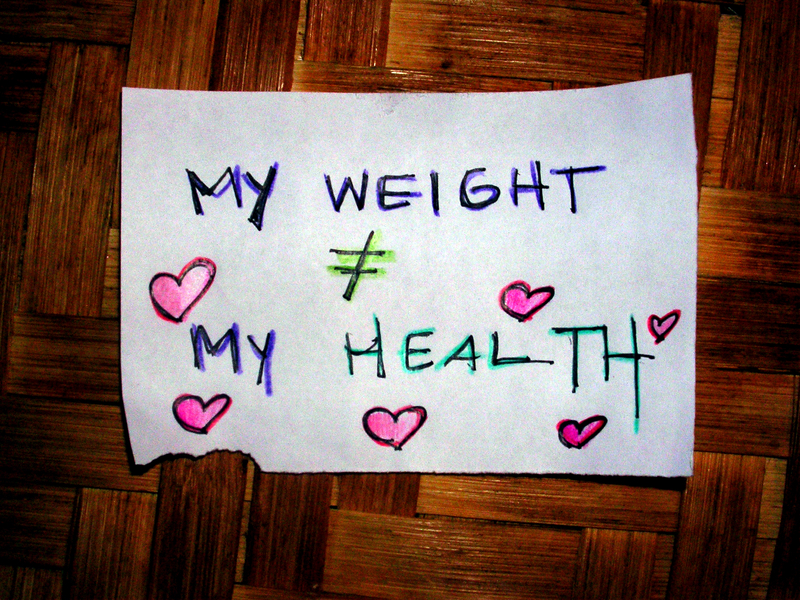 In my opinion, there are better ways to measure health than numbers on a scale. I measure my health by how much weight I can squat and how many vegetables I eat. How do you measure yours? 7 Responses to What Does Weight Matter? i just came across your blog and wanted to tell you i really enjoyed this post! it’s true, the scale is a very personal thing. for me it’s just a tool, nothing else. it has no baring on my mood or how i see myself, it’s just a device to let me know where i’m at. guess i’m lucky that way. i wish all women knew their value came from SO much more. I’m glad you enjoyed this post! You ARE lucky! Very few of my female friends can use a scale without dredging up baggage– I also wish that more women could free themselves from the idea that their weight is related to their self worth. In my opinion, weight should be purely measurement with no strings attached! Thanks for stopping by! I could not agree with you more, however I continue to want to see the scale. I would like to progress 100% to measuring my weight by what my body can do. One of the best posts on a blog I’ve read in quite some time. Bravo. Thanks, Craig! It took me a pretty long time to not want to see the scale anymore…I just finally realized that my health goals were to get stronger–and not necessarily to get lighter– so I decided to focus on my strength instead of the scale…but it took me a while. It sounds like you’re on your way, though– awarness is most of the battle! LOVE this post. Love it, love it, love it. And I also love you, you are beautiful and smart and fit and awesome!! Yay! I’m glad you like it! Thanks so much, lady! You too are smart, beautiful, fit and awesome!